Towson, MD – Nine Baltimore County Public Schools students placed in the top 10 in their events at the 75th Annual Future Business Leaders of America (FBLA) National Leadership Conference, held in Anaheim, CA, from June 29 – July 2. 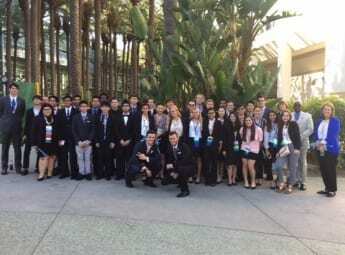 In total, 58 BCPS students and seven BCPS advisers were part of the nearly 200 strong delegation from Maryland. The student participants qualified for their national level events by winning at both the regional and state level.They represented Catonsville, Dulaney, Eastern Tech, Hereford, Overlea, Parkville, Patapsco, Perry Hall, Randallstown, and Sparrows Point high schools. In addition to competing, students took part in a variety of leadership development sessions.More than 12,000 students attended the national conference from all 50 states, as well as China, Haiti, and Puerto Rico. Future Business Leaders of America – Phi Beta Lambda, Inc. (FBLA – PBL) is the largest career student organization in the world. Each year, FBLA – PBL helps more than 230,000 members prepare for careers in business.FBLA is a co-curricular organization for business and computer science students.BCPS has chapters at most high schools and has recently installed some chapters at the middle school level. Next year’s national conference will be held in Baltimore. The Maryland FBLA will be looking for business partners to help judge the more than 70 business and computer science-related events. More information on FBLA as well as video clips of the winners, when posted, can be found at the FBLA national website.